Arc flash and arc blast hazards have been around since electrical power has existed, but they have only recently been addressed in national standards. The National Fire Protection Association’s Standard for Electrical Safety in the Workplace (NFPA70E) states that all facilities must perform an arc flash risk assessment to determine the present degree of hazards, and then apply appropriate equipment labeling. The goal of an arc flash assessment is to: 1) identify arc flash hazards, 2) estimate the likelihood of occurrence and the potential severity of injury or damage to health and 3) determine if additional protective measures are required. In accordance with NFPA 70E standards, arc flash studies should be conducted every five years or whenever a major modification is made to the facility. Keep in mind, even if you haven’t had a major change to your facility within the prescribed five-year window, the energy levels could still change. For instance, if a new development or large industrial park with a huge energy demand is built adjacent to your facility, the utility may need to ramp service to provide power to its new customers. In doing so, the amount of fault current delivered to your facility can change. It’s important to consider external factors such as this to determine how often you need to revisit. 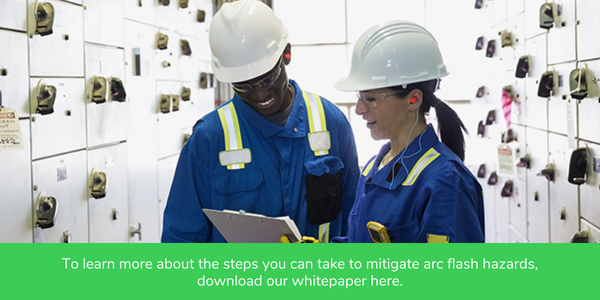 Completing an arc flash study may take about four to six weeks depending on the size of the facility. The governing standard for performing the study is the Institute of Electrical and Electronics Engineers (IEEE) 1584. It provides techniques and calculations for engineers to apply when determining the arc flash hazard distance and the incident energy to which employees could be exposed. The calculations enable facility operators to determine the necessary personal protective equipment (PPE) to address the arc flash hazard. Below are some things to consider before having an arc flash study performed. Engineer: The study must be conducted by a professional engineer who is registered in the state where the facility operates (regulations vary by state). The engineer should be experienced in performing power system analysis. Data collection: Study results depend on the data collection; as such, accurate data must be collected from every piece of equipment within the scope of the study. The data collector must perform a walk thru of the distribution system. It is best to utilize an engineer or electrician who is very familiar with the site’s electrical distribution system and processes. Software: Commercially available software tools make it much easier and faster to do calculations and analyze the study data. It is recommended that the customer standardize on a single software platform across their entire enterprise. Goals: Whether reducing energy levels or modernizing equipment, set clearly defined goals for the study and communicate them to the engineer(s) conducting the study so they can tailor recommendations to help you achieve those goals. As you’re setting up the study, there may be a few challenges that arise. For instance, how do yougather the data safely? Can you shut down the equipment? As often as possible, electrical personnel should avoid working on equipment while it’s energized to reduce the risk of shock or electrocution, however, in certain instances, a shutdown won’t be possible. If the facility one-line drawing is incomplete, outdated or doesn’t exist, you’ll need to create one — this may add time to the process, but it’s necessary for accurate data collection. Expect study outputs or “deliverables” to include a summary of the findings with recommendations for corrective action(s), a short circuit analysis, time coordination study and arc flash incident energy labels, to name a few. An aside, different engineers can evaluate the same system and receive vastly different results. The likely reason for this is that the engineers did not use the same initial set up and assumptions. To avoid this, the consultant conducting the study should address the specifications with the facility engineer at the onset of the study so the engineer understands the assumptions made by the consultant and why. Once you have the study results in hand, incorporate them into your Electrical Safe Workplace Practices (ESWP) policy in accordance with NFPA 70E standards. Next, train staff on how to use the study, interpret the results and understand the arc flash incident energy labels. Labeling can be one of the more confusing aspects of implementing the study. There are multiple standards that address electrical hazard labeling, and each standard governs a particular aspect of the labeling requirements (for example label material, content and symbology). The labels should be an important part of your facility’s ESWP and the information must be clear and understood by electrical workers if they are to be used effectively to mitigate the arc flash hazards. At the end of the day, a successful arc flash risk assessment should be a living document. It is an important part of a facility’s ESWP that should be constantly revisited over time, not just a document that sits on the shelf. Learn how to improve your “zero accident” safety policy with our electrical safety training.